Come one come all! Today, I am going to share an exciting magic trick with you, the likes of which you have never seen, not even from the great David Copperfield. Forgive me for the excessive theatrics. I am, in fact, not going to perform a magic trick. I apologize for the letdown, but it is much better to ask for forgiveness than permission (or maybe it’s the other way around). Although I will not be outlining the details of a magic trick below, I will be talking about something cool and I believe we can all benefit from a little ‘cool’ these days. Today I will show you how to lock a door without a lock. How to lock a door without a lock? Yes, you read that right. In case you think you’re seeing things, I will repeat it once more. Today, I will show you how to lock a door without a lock. Alas, you might be wondering if this goes against the moral code of the Lock Blog, but I assure you it does not. Although locks are commonly used as the primary locking mechanism on doors, they are not the only available solutions. I feel like I just let you in on a guarded industry secret, but there’s no such thing, so let’s get right into learning how to lock a door without a lock. Why does knowing how to lock a door without a lock come in handy? The primary purpose of any door lock is to keep things secure. Installing a door lock on a door is one of the best ways to secure a door, but there are other alternative solutions. Learning how to lock a door without a lock comes in handy because it gives you a more versatile skill set. In fact, you can totally include this in the section of your resume that asks you how to lock a door without a door lock (I joke, I joke). In all seriousness, knowing how to lock a door without a lock can really help you elevate your security and get you out of tight spots. What kind of tight spots am I referring to? Let’s say you damage your bedroom door lock late at night and you would rather avoid calling a 24-hour emergency locksmith, even though you should call them. Instead of having to sleep with your door ajar, wouldn’t you prefer to have alternative locking methods? Knowing how to lock a door without a lock is a great solution for your broken lock. If that example doesn’t persuade you, let’s imagine that you take a trip to lovely Honduras, which ranks highest for global murder rate, wouldn’t you want to have the benefit of fortifying your doors with some of the cool methods we are about to discuss? Learning how to lock a door without a lock will help you deal with damaged locks or doors that do not have locks installed on them. Taking the time to learn how to lock a door without a lock can help you improvise emergency locking solutions in dire times like active shooter situations, and it can be the very thing that helps save your life. Are you convinced yet? I hope so because we are about to go on a magic carpet ride (no we’re not, but you catch my drift). Not every door is equipped with an effective locking mechanism. The easiest solution is often the most simple and straightforward one. That is why the first answer to the question ‘how to lock a door without a lock’, is simply to add a portable lock. 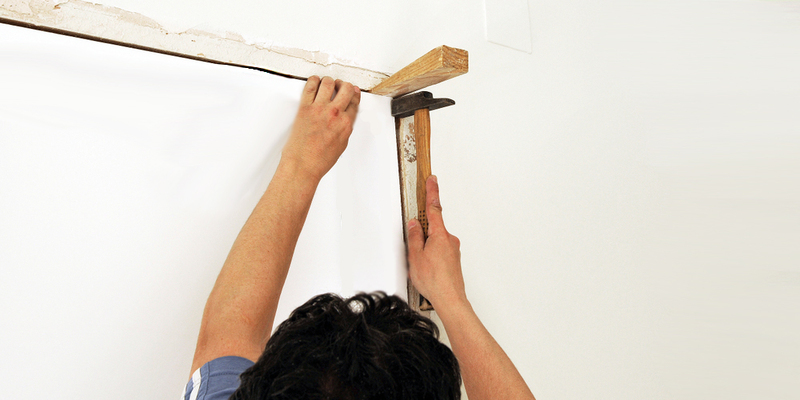 This solution works great for doors that merely have handle sets attached to them. Some doors are equipped with handle sets that do not have any locking capabilities. 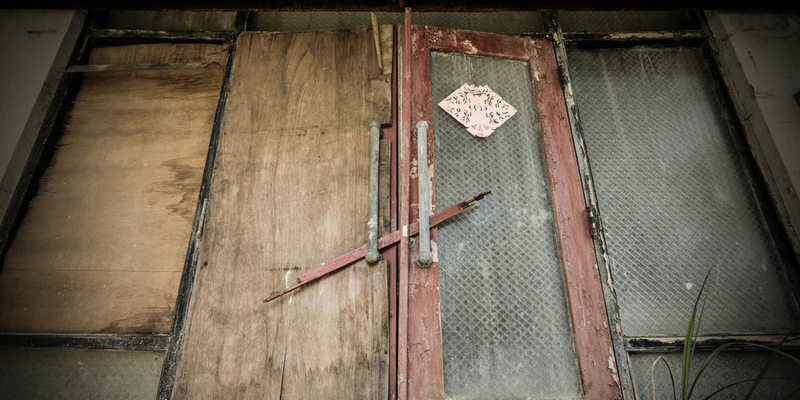 These kinds of doors are often found in some commercial buildings and in residential properties. They are commonly used as connecting doors between common areas or as bedroom doors in hostels or homes. Primarily, they are interior doors. However, if the need for a lock arises, one can always be added. Now, I do not want you to think you’ve been duped because I’m talking about adding a lock. Adding a lock doesn’t necessarily mean you have to contact a locksmith for a lock installation or even install it yourself. I understand that the people who need answers to the question of how to lock a door without a lock, desire a timely and efficient solution. In lieu of using traditional door locks, portable locks can be used to lock a door without a lock. Portable locks are very popular among tourists and travelers who want to maximize their travel security. Although, I think their use can be extended to some commercial and residential spaces as well. These add-on locks are easy to install and they can effectively lock a door without a lock in a matter of minutes. There are a wide variety of portable door locks that people can choose from, so it’s always best to choose the one that best fits your needs. These locks are usually fitted on the side of the door that opens towards the area you want to keep locked and secure. This kind of portable lock is mostly meant for use on internal doors and is not particularly suited for guarding exterior entry doors. As far as internal use goes, portable door locks prevent doors from being opened from the outside, even by people who might have a key. Some common examples of portable door locks are the traveler’s security lock and the Addalock door mechanism. Portable door locks are lightweight and efficient. This means they can easily be carried anywhere. This makes them a prime personal security measure and tool that can be taken advantage of in emergencies. Using portable locks to add a lock to a door can be done in minutes. Most of the products are geared towards being easily installed. Hassle free installation is a plus for many users. Adding a lock to a door can prevent it from being opened by traditional means. However, it offers very little resistance to brute force attacks. Most portable door locks are not able to withstand force in the same way a secure deadbolt can withstand force being applied to it. Enjoying the magic so far? I hope you are because there is still a lot more to go. In the pursuit of learning how to lock a door without a lock, we arrive at the solution of disassembling the handle set or door knob. You should be aware of the fact that not all doors with handle sets and knobs have locks to accompany them. As I pointed out, some doors are not initially constructed with the primary mandate to be locked, but this can always change. If you need to lock a door without a lock, you can always resort to removing the handle set and door knob. A lock does not always have to be present for something to be locked and secured. The process of locking is meant to restrict access. If you are able to restrict access without a lock, then you have successfully locked a door without a lock. Most door handlesets and door knobs make use of spindles to connect both halves of the door set. The handle turns the spindle, which then retracts the latch to open the door. If the spindle and the outer door handle and door knob are removed, your door will effectively be locked. This method prevents the latch in most doors from being retracted, which keeps the door securely closed. This process is rather easy to carry out and can be done with simple tools like a screw driver. This method restricts access, but it also impairs egress as well. It is important to take this into consideration for residential and commercial spaces that might have specific safety plans in place. Ideally, you do not want to be trapped behind a door, struggling to open it in the midst of an emergency. The door can always be opened from whatever side you are on because you will have access to the necessary parts. However, you will have to take the time to put them all back together again, a la Humpty Dumpty. This solution is able to provide a locking solution on inswing doors and outswing doors. The process is relatively easy and can be carried out on most interior commercial and residential doors if you have access to a screw driver. Disassembling the door handle and door knob poses a safety hazard because it restricts egress. This locking solution does not prevent someone from kicking in the door or accessing a certain area via forceful physical attacks. The process of barricading a door can be done to doors that have locks and those that do not. Since we are trying to learn how to lock a door without a lock, we will be focusing on the latter. One of the most important things you have to be aware of before you barricade a door is the way it opens. Traditionally, single doors open either inswing or outswing. Ideally, you should be barricaded against the direction that a door opens, if not your efforts will be futile. This same concept applies to sliding glass doors and double doors as well. The reason is simple. If you do not barricade against the direction that the door opens, whoever wants to open the door can remove your barricade solution. Unlike some of the other methods we have already discussed, you can barricade exterior doors and interior doors as well. In addition to the primary mandate to keep a door locked and secure, barricades are also meant to withstand the application of excess force. This means that the ideal barricade should be able to resist kicking, ramming and other forceful attacks. Barricades can either be improvised or pre-constructed. Improvised barricades are made by stacking various items against a door. They are usually stacked in the direction that the door opens. In constructing an improvised barricade, you need to choose materials that are proportional, in size and weight, to the door that you are barricading. Choosing items that are much smaller and lighter than the door they are meant to secure, your barricade will be easily thwarted. Some of the best items to use for barricades include chairs, desks, bed frames, or other heavy objects that can be stacked against a door. Ideally, the base of your barricade should always be an item that extends past the size of the doors entryway. A barricade should effectively secure your door from top to bottom. Pre-constructed barricades require fewer materials than improvised barricades. Security bars are a common example of pre-constructed door barricades. They are placed along door entryways, in opposition to the direction that a door opens. Door barricades can also be fitted to the base of the door itself. A perfect example of these kinds of barricades is the Nightlock residential door lock barricade or the Haven smart lock. Unlike most alternative door lock solutions, barricades focus on minimizing the impact of forceful attacks. If a barricade is effective, it can withstand excessive amounts of force. Improvised door barricades are cost effective and can be put together by combining easily accessible objects like desks, chairs, bed frames etc. Constructed barricades are very easily installed. Also, they do not impair egress, which makes it easy to exit a room in the case of an emergency. Barricades cannot be used to secure the front end of left-hand inswing doors. Improvised barricades are not usually as strong as constructed barricades. The strength of your improvised barricade will depend on the items you have around you, which leaves your safety and security up to chance. Door jammers and door wedges are similar to constructed door barricades. The main purpose of these devices is to restrict the mobility of the door. However, they are much smaller than your average barricade and often focus on guarding specific sections of a door. These tools work as great solutions to lock a door without a lock and they do not take up nearly as much space as the door barricades that were just discussed above. A majority of these tools are designed to be placed at the bottom of a doorway or along the door frame. They restrict the type of momentum that is necessary to open a door and this essentially keeps the door locked and secured. Door jammers can be used on doors in residential and commercial spaces. The versatility of door jammers and wedges is dependent on their size. Similar to a door barricade, you should know how a door opens so that you appropriately position your door jammer. If you place the door jammer on the wrong side of the door, it will be removed and your ‘lock’ will be ineffective. Wedges are primarily placed on the bottom of a door, while jammers and stoppers can be placed under the door handle or under the door itself. Restricting the mobility of the door handle is one of the best ways to prevent it from being used to open a door. Also, most of these jammers use the door’s weight and the force being applied against it. This effectively keeps the door securely held in place. Improvised door jammers and wedges can be constructed from everyday household items like chairs and shoes. Securely wedging a shoe at the bottom of a door can help keep it securely in place. Alternatively, propping angling a door to rest under a door handle or door knob prevents it from being turned. Locking a door without a lock does not always involve traditional locks, but these type of door jammers can be used on doors with traditional locks as well. Wedges, door jammers and door stoppers, are great tools for restricting the mobility of doors and door handles. Improvised wedges and stoppers can be constructed from everyday household items. This solution works well on doors that do not have any handle sets or knobs. Wedges are mostly suited for doors that open inwards and rely on force being exerted on the opposite end of the door. Improvised wedges are not as strong as constructed wedges, and they will not last long as solutions for locking a door without a lock. Anchoring the door knob or the handle set of a door is primarily geared towards doors that open outwards and away from the space you want to keep secure. When it comes to doors like these, most of the locking solutions that were discussed above are at a disadvantage. This is because doors that open outwards usually give the person opening the door the upper hand. If there were a barricade placed in their way, they would easily be able to overcome it. Anchoring a door knob or handle set can be used on inswing doors that open towards the body of the person trying to open the door. It should be noted that anchoring a door knob is somewhat of an improvised method. To accomplish this, you will need a material that connects your door knob to an anchor point. Ropes, extension cords, and belts have all been successfully used as connecting materials. It should be noted that the strength of the connector you use will determine the strength of your lock. To lock a door without a lock, you will have to tie one part of the connecting material to the handle of the door, and then tie another part around a solid anchor point. An ideal anchor point is a solid material that is securely anchored down to the ground. Anchor points are often solid beams that counteract the force that is being exerted to open a door. If you are trying to lock multiple inswinging doors, one of the best things to do is to anchor the doors to each other. That way, each door will act as an anchor point to the other. Utilising an anchor point is mostly effective on doors that open outwards toward the person opening it. Anchor points can be made of cost-effective and easily accessible materials that most people will have access to. An anchor point solution will not work without the presence of the something to securely tie the door handle to. Always know how the door you want to lock opens. Implementing any of the above solutions on the wrong side of the door will be ineffective. Know when to use improvised solutions and when not to use them. If you have the luxury of time, try your best to choose constructed locking methods like security bars and residential lock barricades. Locking a door without a lock will be ineffective if there are other easy access points around the door that are not secured. If you secure the door, take steps to secure windows, glass panes and any other weak points that can be exploited. When using door wedges, jammers, and door stops, make sure that they cannot be accessed from the bottom of the door and pushed out of the way. Take the time to seal of any open spaces that can be compromised. That, folks, is the end of my magic trick. I hope that showing you how to lock a door without a lock has proved truly beneficial. I know that most of you will not utilize this information immediately. However, I still believe it will come in handy, and not just as security insight for doomsday preppers. Armed with this knowledge, you will be able to secure doors that have broken locks, doors that have no locks, and even doors that do not have adequate locks installed. As always, if you have any suggestions on other cool ways to lock a door without a lock, please leave a comment below.